With the impending completion of Our DIY House arriving soon (I hope! ), I’ve been trying to get as many decor things done in advance as I possibly can. Little C’s room is one of the easier ones. She knows exactly what she wants, and I purchased coordinating fabrics for her new room before we ran out of funds (house building is expensive, FYI). 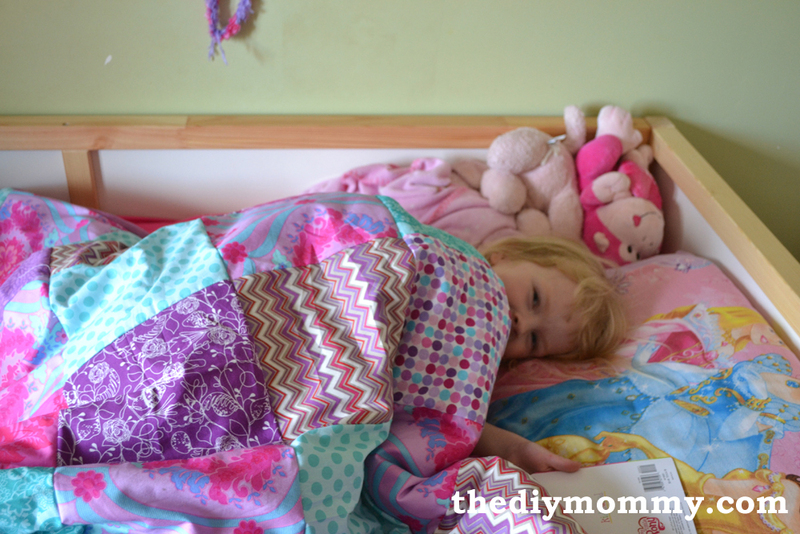 I wanted to make a DIY duvet cover for her that was fun and bright – just like she is. We both love fabric and patterns, so I decided on patching together a bunch of fun prints to make a unique duvet cover. It was easy and we both love the result! 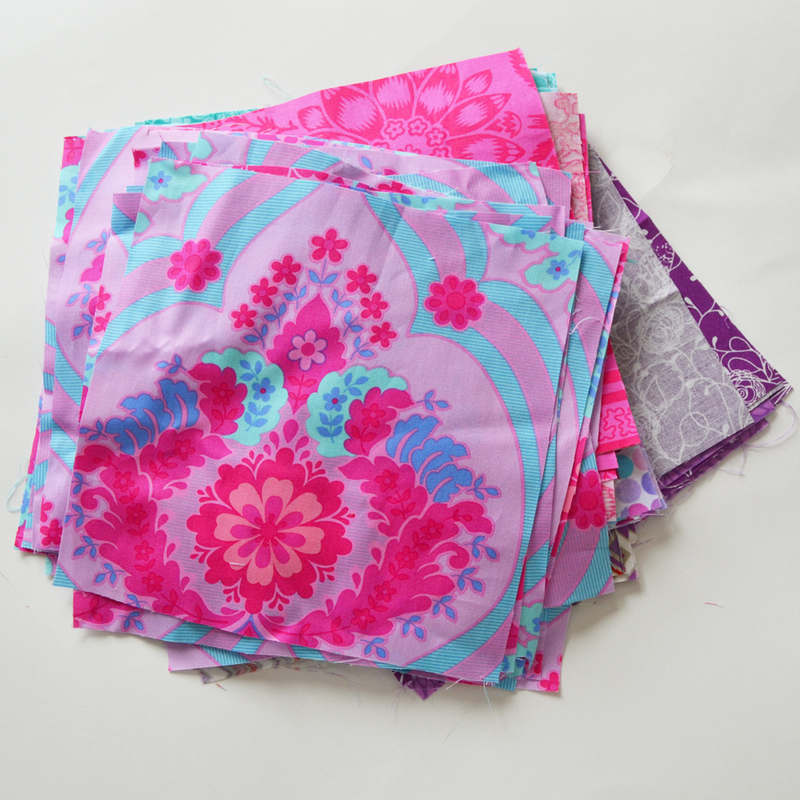 Cut 8 squares of each of the 11 different fabrics that measure 8 1/2″ x 8 1/2″. I used a ruler, cutting mat and rotary cutter to make this go nice and fast! Arrange your first strip of squares in a pattern that’s pleasing to you. I laid them out on the floor and fiddled around until I came up with a pattern I liked. Then, I decided that my next row would follow the same order but I’d start on the 4th square of my 1st row (and continue the following rows the same way). Does that make sense?! Sew your strips together one by one. 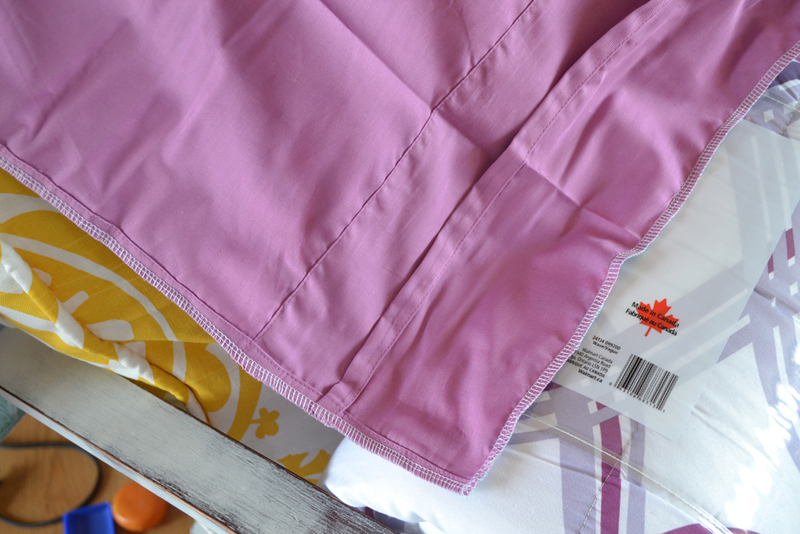 I used a serger so that the reverse side would be finished nicely, but if you don’t have one I’d suggest zig-zagging the seams so that they fray less. Now, sew your rows together. 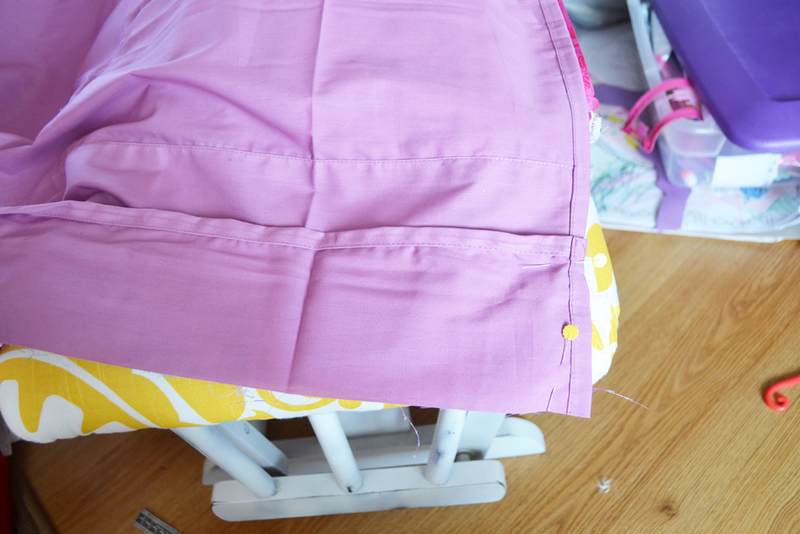 Pin them first (or do it the lazy way like I do – unpinned, very slow, and eyeballing it all the way!). Cut off the bottom 6″ of your sheet. Make sure the cut is straight (use a ruler and cutting mat). You may need to cut off some length on the longer piece like I did to match the length of the patchy front of your duvet cover. 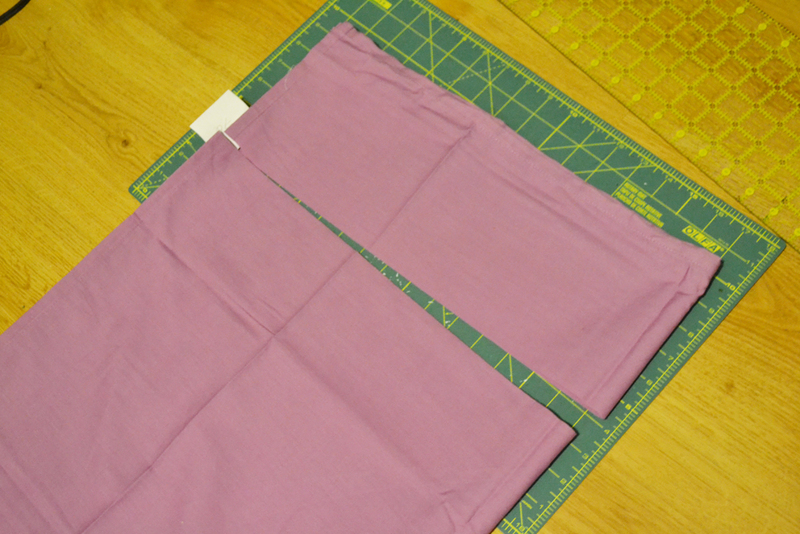 Measure to check (measure both sheet pieces and subtract 2″ for your button/snap band overlap). Pin the right side of the narrow piece you cut off to the right side of the longer piece of the sheet. Overlap them by 1″. The hemmed edges should be facing eachother as shown. If you do it this way, you don’t have to hem anything for the button band! It’s so convenient. Pin the right side of the sheet to the right side of your duvet front. Sew around the entire perimeter. Turn the duvet cover right side out (using the hole in the backside/sheet side). Fasten snaps about 6″ apart along the opening. You can also sew on buttons and sew button holes. Whatever you prefer! Insert your duvet into the duvet cover, snap it up and you’re done! Little C had to make it into a fort over our chairs for its initiation. 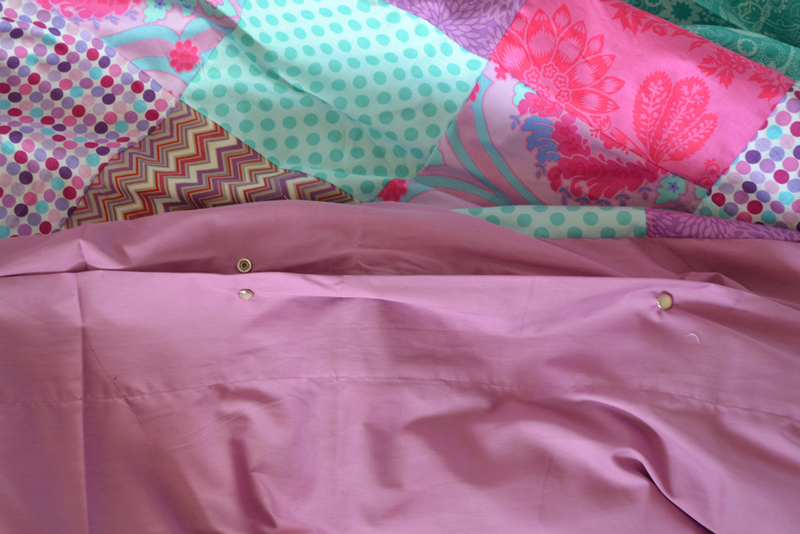 My purple, pink and turquoise loving girl is snug as a bug in a rug… and ready to bring her fancy new duvet to our new home! You make it look so easy! 🙂 What a great piece for your little one to have – completely personalized and made with love! Thanks, Christy. Little C loves her new blankie! It turned out beautifully. And you make it look so easy!! Actually, I think I might be able to swing this..have to get a rotary cutter thinger – that probably makes a huge difference, right? Thanks, Amanda. You could totally do this! Yes – a rotary cutter makes it SO much easier to cut straight lines. It’s much faster than scissors! This is so beautiful! Love that it is customized and that you made it. Makes me feel sad that I can’t sew. I keep telling myself I will learn. Oh this is pretty, and it doesn’t look too hard to do. My sister was talking about making one so I’m going to show her this tutorial! Thanks, Elizabeth. This really is quite easy – I think it would be a great beginner’s sewing project! Gorgeous! What an awesome idea. I was looking everywhere for wide-width organic cotton fabric for the wool duvet I made my daughter – but this would have saved me the trouble! Definitely going to do this for the next one! Judith recently posted..Green Deal Alert: well.ca moving sale! Thanks, Judith. 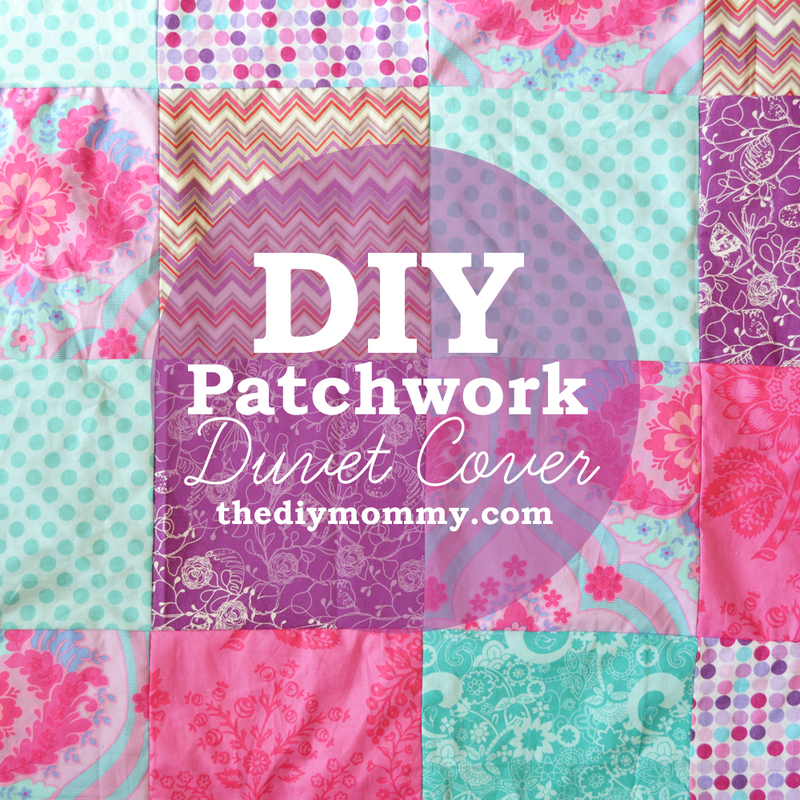 Yes – this works really well if you want to use a fabric that’s not wide enough for a duvet! I love this! What great colors you chose. Your directions make it nice and simple. One of the best ones for duvet covers I’ve seen yet! Thanks so much, Rachel! My daughter picked the colours and I think they’re so fun. Thanks so much for visiting my blog! You don’t happen to remember the name or designer of the hot pink/turquoise tropical looking print do you? Or where you got it? I can’t find it anywhere! Thanks, Lauren! 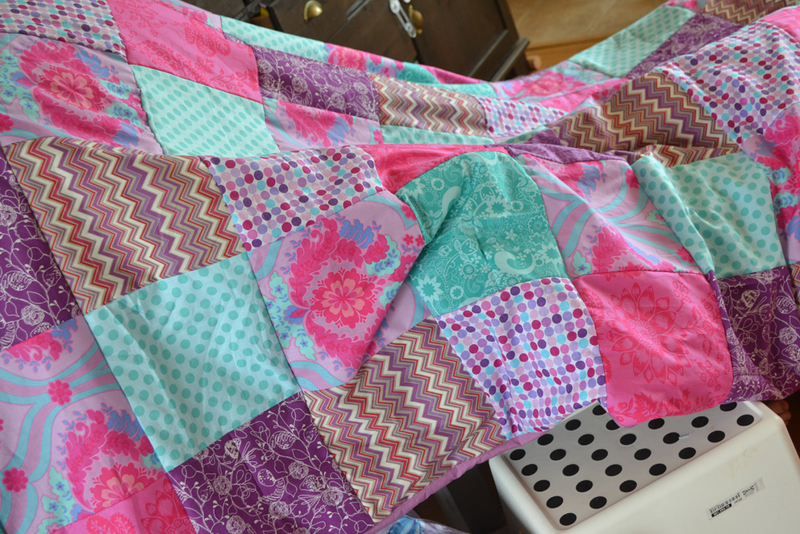 Unfortunately that fabric seems to be out of print now – I looked for it again later to make some matching things. 🙁 It was by Jennifer Paganelli and the line was called “Crazy Love”. 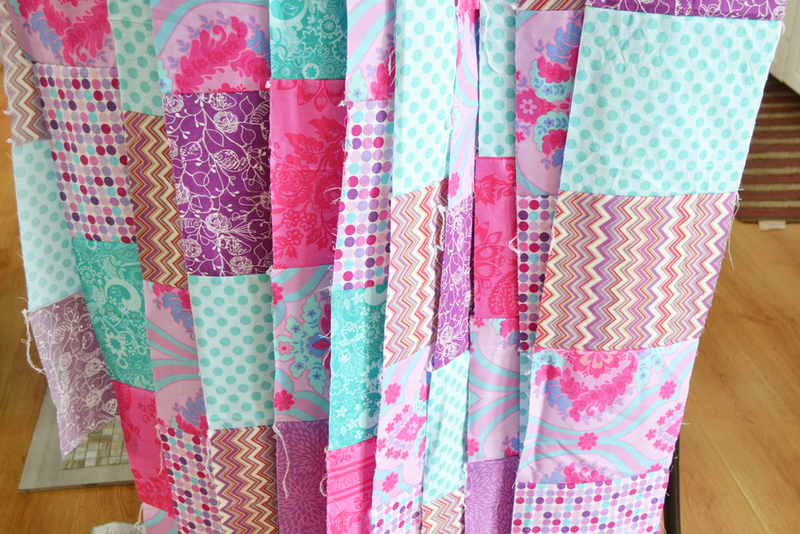 How many squares of each of the 11 different fabrics did you cut? I’m trying to make one for my daughter as we redo her bedroom into a Paris theme. So you used 1 sheet? 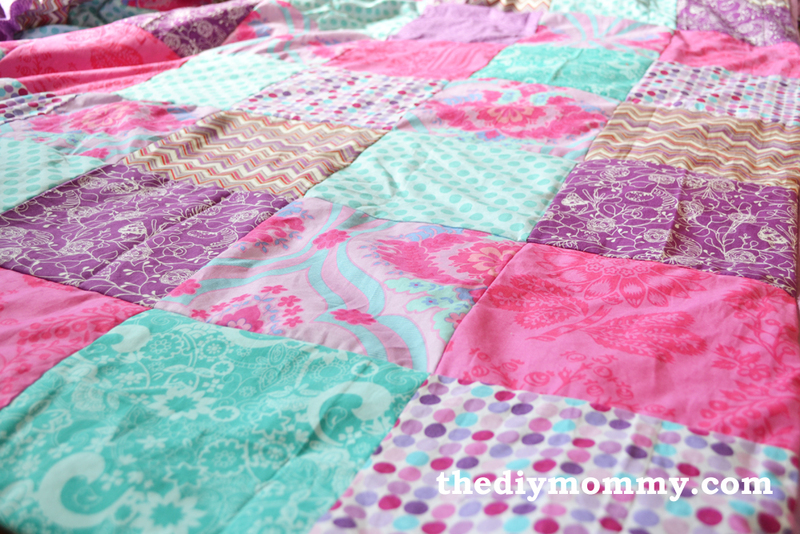 Then the quilted top rests directly on the comforter. I was thinking of using 2 sheets. One is attached to the quilted top (and you run some stitches to quilt it place). The other sheet attached as stated above. 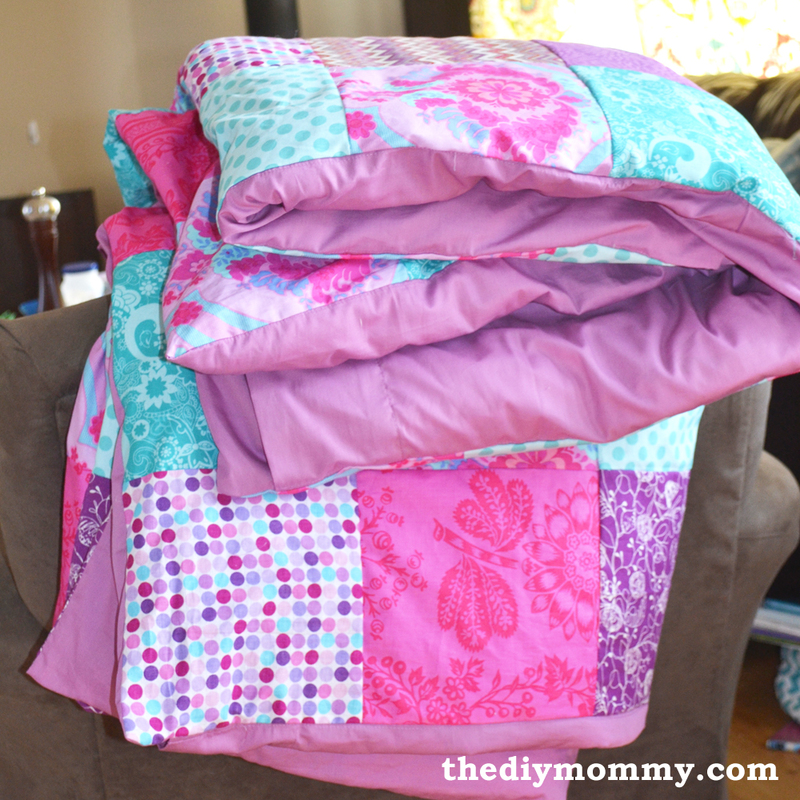 Would’t This method protect the quilt underside better? I’m concerned the seams would be too stressed without it. 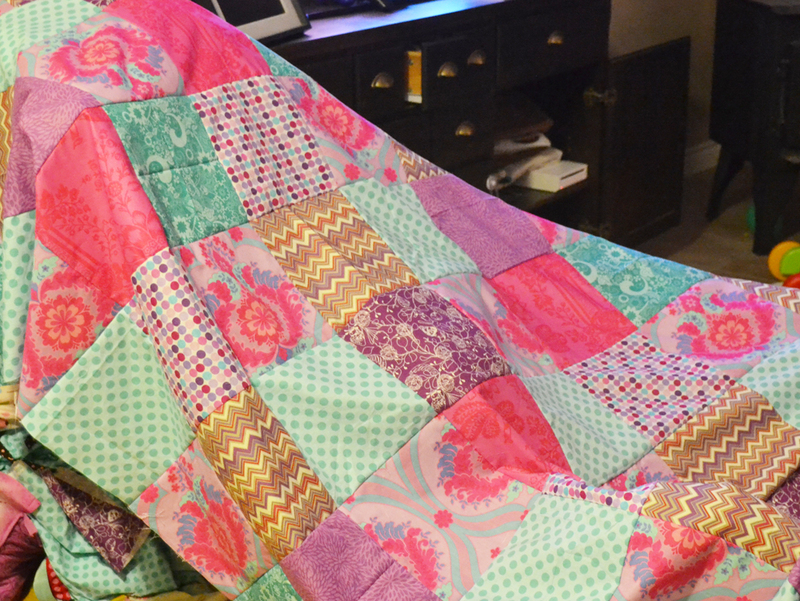 That is what I am going to do for my dtr’s queen size duvet with the patchwork top I made for her. So glad I found this though, I couldn’t figure out how to put together nicely. This should work! Yeah one more UFO done!